Suddenly things happen really fast. Gareth Nicholls keeps saying 'it's getting there' and it is, it is getting there fast. The milk carton in my fridge has the date of the opening night on it, that's how close we are to being done. The stage is set, the lights are focused, beards have been trimmed, shoes are worn in, props finalised, music timed. Later this week the audience comes in for the first preview and then suddenly, suddenly the festival is upon us. I love tech week, it's when all the teams involved in the show come together to work towards making the show as good as we can make it. You sometimes forget how many different artists it takes to make 80 minutes of entertainment until they all rush in on the morning of the tech. But a show is nothing without the audience and with this show, more so than any other I have worked on that doesn't include audience participation, what an audience will make of it is going to be so exciting to find out. Will you be thrilled? Angry? Shocked? Delighted? All four? How will you respond? This is the first ever (super dark) comedy I have worked on. We've laughed a lot. But we've also got used to the jokes, so what we used to laugh out loud at we now smile at. Getting fresh eyes on it is going to inform us so much. Robbie Jack had a great way of describing David Ireland's work; he said that he gives you three ways to score the goal, meaning unlike a lot of comedy writing that has to be delivered a certain way for the punchline to hit David's work is funny whether you play it straight, big or with a knowing wink and nod. That is a brilliant gift to the actors and director but it means the work at this last stage is all about knowing where to pitch it, choosing the way to score the goals. We know the characters, we know the play, we know everyone's intent, their flaws, the things they hear and the things they ignore for one reason or another, their relationships to each other, where the power shifts, what needs space and what needs pace. Now the work is about the arc of the show, and the flavour of it. It is about doing full runs and seeing the entire journey. Because it is funny but it is also about so many dead serious things. It is a rollercoaster that swings between the belly laughing ridiculous and the hold your breath harrowing and both those atmospheres must be created. I guess we'll only know once you've taken your seats and the lights come up. But I think we're getting there. We're getting there fast. See you soon. We are two weeks into rehearsing Ulster American and I find myself altered. Being in a world of a play eight hours a day is starting to really change how I see things. How I talk. I get like this working on a play, its ideas and its language will take more and more hold of me the more time I spend with it. For instance, David Ireland's play has an almost unrelenting rhythm to it, it is filled with swear words and is an examination of language, so I find myself talking quicker than I normally would, swearing more than I should and analysing what other people say just like we've analysed what the characters say more than anyone would feel was appropriate in everyday conversation. 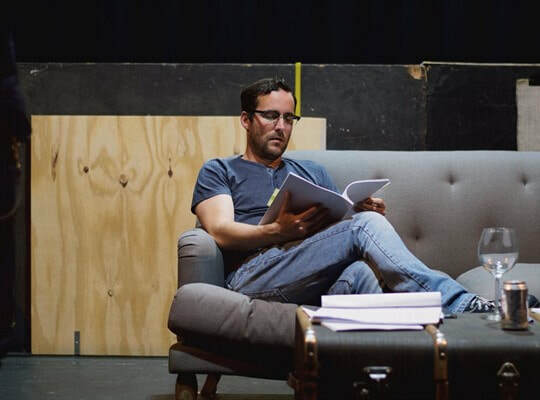 The first time that we went through the script we focused on understanding it, the second time we started playing around with it and this third time, starting this third week, is about making decisions regarding those rhythms, those intentions and those moments of play. Finding the shape of things. But it's still all about the words. The things the characters say and the way they say it. And those words are colouring my worldview. For example, the characters say "Okay" a lot. But it means a different thing each time someone says it. Okay is one of those slippery words that can mean yes, can mean no, can mean alright, can mean hang on now let me process this, can mean let me see if I have understood you correctly, can mean great, can mean not great, can mean I want to stop this conversation, can mean I have stopped listening, can mean anything. It can be seen as consent when it isn't meant like consent. It embodies Derrida's ideas of slippage perfectly, that we can't discern a "truth" in words because meaning evades us. There's a million ways to say something and there's a million ways of taking what has been said and coming to a conclusion of its meaning. And we make a lot of decisions in split seconds with our understanding of things, we decide upon intent and more importantly, we get it wrong just as much as we get it right. If you don't believe me try having an argument over text. Some words have more weight than others. They carry actions within them, history, they stir feeling. We know them when we see them, because they hit us hard. They slap us across the face, leave us gobsmacked. We treat them differently and we are aware when they leave our mouths. We know the power of them. These will be different for each of us. There's the thing we just won't say and the thing we just can't stand to hear. They may be very different. I say again, try having an argument (in real life or over text). See how quickly it becomes about language rather than actions. Ulster American is at heart about language and rehearsing it to a backdrop of riots in Northern Ireland and Trump's baby blimp in the sky and Brexit chaos has got me thinking of the power of words versus the power of action. To the point of being weary of sending a text or writing this blog. Because speaking is action. And we say the wrong thing more easily than we do the wrong thing. Or we assume someone has said the wrong thing, in a way we wouldn't assume someone's done the wrong thing. But the right thing, said at the right time, can change everything. The same goes for the wrong thing. It all depends on what is said, and how that is interpreted. Were we really listening to what was being said or did we hear what we wanted to? Do we mean what we say and say what we mean? And do we get away with saying things we would never do? What's okay? In Iceland what the rest of the world refers to as #MeToo got called 'the falling of the curtain'. I love that, because it was an unveiling, a big reveal of the things that were going on behind the scenes, a big show and tell of what happened on what was once referred to (almost affectionately) as 'the casting couch', and it showed us what we knew, but didn't want to see. It was no longer hearsay. It was no longer imaginary. It wasn't something we could ignore or look away from or expect to have to keep shtum about any longer. It was centre stage, the spotlight on at 100% intensity. And so we had to face ourselves, as an industry and ask ourselves the difficult question: were we perpetrators, complicit in our willingness to cover it up or victims ourselves? When the curtain fell everyone wondered what their role had been. Unlike most Twitterstorms, this one really changed things. Momentarily in some ways, the outcry can't last for forever, we'd all go deaf. But we cannot go back to our normal stories either, our obsession with stories about women being mistreated in some way has to be examined. There is an element of fundamental change to this particular movement. We still have a lot of questions to ask ourselves as an industry. What stories do we tell and why? How do we tell them? And how do we get the people on stage to enact them? And how are they viewed? Have we embedded abuse of power at every level? I am willing to bet that whatever people are rehearsing ahead of this Festival, the discussion will at some point lead to why time is up for the workplace culture that let the industry get so bad. 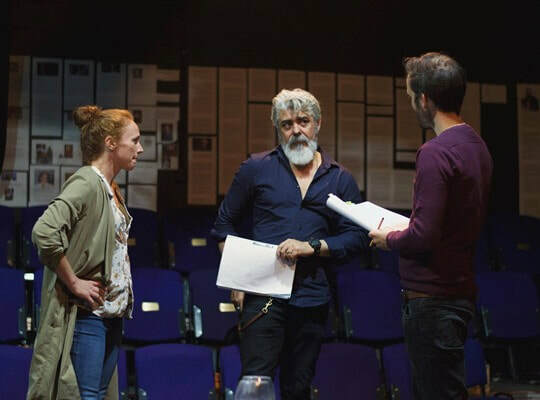 Dissecting and rehearsing Ulster American - about three people who have come together to put on a play - will undoubtedly bring up more of such discussions than others. But it is on everyone's minds. An actor. A playwright. A director. In the context of Ulster American, we have three representatives of the industry on stage. An actor. A playwright. A director. The actor, Jay Conway, is an Oscar-winning film star and as we look to Hollywood for possible parallels for the character, we keep coming across figures in the wider scope of tinsel town. Men who we have had to acknowledge that they are guilty of crossing the line. Not because Jay is like them, but because they are on our minds, these great artists we no longer can see in the same light. But we, as theatre professionals ourselves, are also keenly aware of the dangers of blending the artist's personal life with their work. An artist needs to be seen for their artistic ability, in the light of their work, outside of what we think of them as people. But we have a tendency to merge the two. I know I do. And in the case of #MeToo, the personal entered the workplace, so it's even harder to distinguish the two. Their artistic ability became the power they used over other people. And so, once again we fall into the dichotomy, crave for things to be black or white, for people to be either with us or against, bad people or good. We don't want our favourite actors to be monsters. But we want an industry that can stop them. So we call out for no grey areas. But the world is full of them. David Ireland's characters in Ulster American all occupy a grey area. They are all both good and bad. And the things he has them think, say, go through and the flaws they reveal are going to reveal a lot about the audience watching. Because they aren't simple, they refuse to behave and be boxed into neat little categories. And by doing so David cleverly drops the curtain and unveils our own internal contradictions, our own messy morals and our own biases. This first week has been an incredible insight into the unique conditions of new writing rehearsal processes. Each day we've worked on a section of the text and each day David has adjusted it, tweaked it, cut it, reworded it and made it better. He even makes it look easy. It's been such a joy to be part of a room where everyone has such wealth of experience to give to this process. Each actor keeping a firm eye on their character's journey as the text gets developed, Gareth keeping track of the changes from draft to draft, me hoping to ask the right questions of each element as to maintain the plays central focus and David filtering what is useful from what goes against what the play looks like from his point of view. Because it is his vision that we are all teasing out, hoping to strengthen and take care of. This stage is about asking the questions, and bit by bit we're finding the answers. And so three fictional theatre people get examined by six actual theatre people. A play gets staged about a play. An industry will look at what an industry has presented about the industry. Because the curtain has dropped. Might as well take a good look. 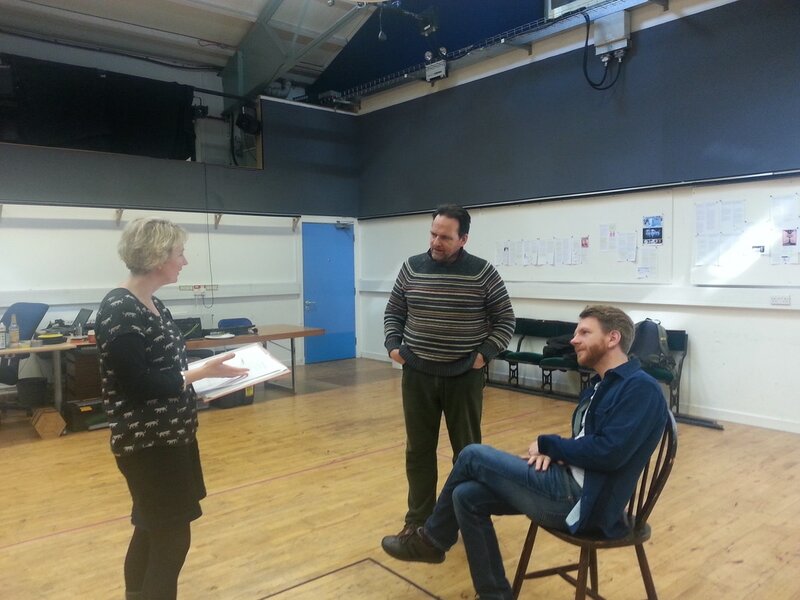 Today, Monday 2nd, we start rehearsals on Ulster American by David Ireland. It feels like the first day of school. I have a new dress and a new notebook ready. Pens in a case. Lunchbox waiting on my kitchen counter to be filled each morning. In four weeks' time, there will be an exam (a preview) and then a graduation just about a week later (press night). But that's as far as the school metaphor stretches. Because a show is not exactly like a degree, though you learn a heck of a lot along the way. The process of making the show started ages ago. You could say it started when David had the idea for the play. When Gareth Nicholls, our director, first read the first draft. When the Traverse put it in its programme. When the casting started. When the Traverse interviewed for a JMK assistant director and got me. When the new draft came in. And the one after that. 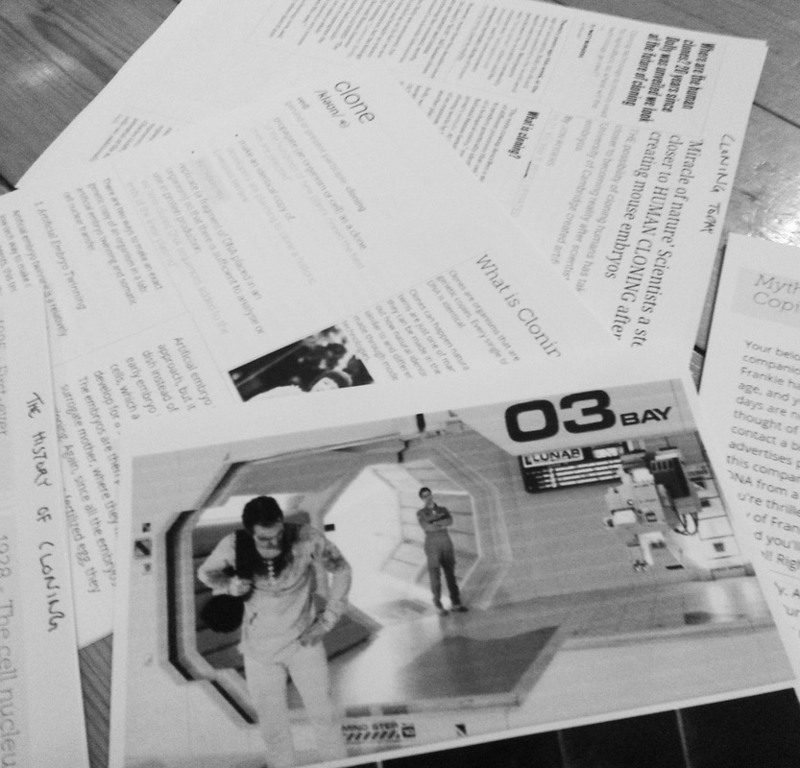 When we spent a day developing the text. When Becky Minto and Kate Bonney sat down with Gareth and went over the design. When we spent an afternoon looking at floor options with our production team. When the rehearsal schedule got sent out. Today, when we read it through, all together, for the first time. These are all starts in their own right, but also all part of a longer journey. Building blocks towards that show you will see. For me, they've all been part of getting ready. I've been assigned the task of research. To know each cultural reference in the text. The ins and outs of Hollywood; the history of The Troubles in Ireland; our current political climate, the backdrops of the drama that unfolds in David's play. The play isn't about those things as such, but it happens within a world fully grounded in these three strands. It talks about the time we live in. And that time is full of history. Some of the references appear, at first glance, to be common knowledge, but once looked into is way more complex than they seem. Some I was aware beforehand I knew very little about and needed to really dive into, and have lost myself down the alleyways of articles, links and videos only to find that the "truth" of the matter is debatable, as there are two sides to every coin. Some of them seem like a throwaway until you look at them again and realise why David has put these particular things in. I won't call it an onion, because I'm no fan of onions, but this play's references have layers. It's a mille-feuille, made up of three layers of thematic background, alternating with two layers, situation and character. The top layer is dusted with wickedly dark humour. It's a treat to investigate. The real challenge for me is to try and understand, from an outsider's perspective, the impact of The Troubles. It seems to me, though it is not in any way the focus of Ulster American, to be at the heart of all of David's writing. It lends it a complexity only living with the consequences of the messy brutality of a war on your doorstep can. He said to me that the whole world has become like Northern Ireland in the 70s and 80s, with two factions at war on every subject, unable to see each other's point of view. He's not wrong, we seem to be ready to get locked into opposing viewpoints, and for either to be right the other has to be wrong, so the only peace imaginable is a massive compromise, to agree to disagree and pledge to both leave it at that. But can we reach that point without a catastrophe taking place first? As someone who has their future tied to the outcome of Brexit, looking at the Good Friday agreement has been fascinating. Somehow there was an agreement made to bridge Britain and Ireland, a unique balance was struck and a government formed belonging to one but not abandoned by the other. But can we both leave and stay in the EU? It all seems on a knife's edge. It is that pressure cooker environment, that knife's edge, more than the topics themselves that will feed this process I think. Therefore, the research I have made may never really come up. But for me, who has also been asked to keep asking questions of the play, and its production, it is the best foundation to start from. The equivalent of the packed lunch box and the newly sharpened pencils. And today we start. Or rather start the next chapter of this process. I'll try and tell you about my discoveries on the way. Have You Met The Others? And then we met the audience, or the audience met the piece rather, the characters. I don't mean just the reviewers, though their encounter with it seems to have been wonderfully pleasant, and press night was one of the best nights of my year; I mean your normal audience, the ticket purchasers, you who have booked, planned to go or stumbled upon it. We left the safety of the rehearsal room for the buzz of the theatre and held our breath as the first eyes watched it. I sit at the back of the stalls with my notebook and pen, listening to your responses. There is a laughter in a place I didn't expect, a silence so concentrated that an ice cube in a glass or the shift of someone's weight in a seat is detected by all in another. I take it all in. I try not to eavesdrop on your conversation on the way in and more importantly on the way out, but the debates on the events of the play, whose side you take, what you wonder about, is all fascinating to me. A friend wanted to know the semiotic significance of the shade of green used in some of Fred Meller's set. Another wanted to talk about the differences between Brian Ferguson's characters, their shades if you like. One discussed with me the blame of Peter Forbes' character in terms of the events, another wondered how we managed to age him (that would be Ben Ormerod's genius). Most are seeing the piece, or at least this production of it, for the first time. I feel like I know it by heart, yet there are always surprises, slight differences from show to show. Added weight on a line, a natural progression in blocking, the words becoming second nature to the actors etc. 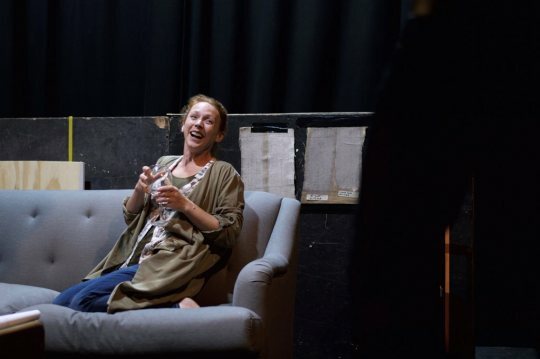 Each show is a new clone, a copy of what Zinnie Harris made with Caryl Churchill's genetic make up for the play, our 'original', yet a personality all of its own in so many ways. It responds to the environment, your laughter, your silence, your looks. It's a beautiful thing to watch. I also wonder how not just the audience's view but the context in which they are viewing it changes from night to night. If you saw the talk between Aleks Krotoski and Pate Kane on the construction of identity online and the affect it has on a sense of 'self' you might have a very different viewpoint on the show than a person sitting next to you who just spent half an hour on the bus surrounded by children before taking their seat. How did a discussion on Scottish national identity between James Robertson and Lesley Riddoch cast light on the possible identity crises of a clone? Is identity always formed in a socio-political and economical context or do direct personal influences trump those when it comes to a sense of 'self'? After Nature, Nurture or Neither, Steve Jones and Simon Watt's discussion on genetics, the scientific elements of the show are sure to have been at the forefront of viewers' minds. Yesterday's discussion on the making of fictional characters and how our so-called selves are used in that creation (or those we perceive around us, our friends, family, a person in the grocery store) by Christopher Brookmyre and Jenny Lindsay had me wondering if the construct of character was unique to fiction or just a replica of how we shape our own 'selves'. Not to mention the mind blowing discussion on whether or not free will is an illusion and the idea of consciousness just a story we tell ourselves (science suggests it might be) - how does that not just change your perception of a show but of life itself? If you sat through all of them, like me, your mind might be racing every time you look in the mirror, recognise stereotypical national behaviour, sneeze or post something on social media. In the words of Freddie Mercury: is this the real life? Is this just fantasy? Being part of this show; the process of interpreting and staging the play, the process of framing that staging with tech and stage craft, the process of tweaking it once it had an audience in and then the process of watching each performance unfold in concession with talks curated by the science festival in response to the subject matters of the show - it's been quite a journey. Personally it has had an effect on how I see my 'self', my writing, my directing practice, my career; as well as the role of a parent, of genetics and of society in shaping a new 'self' and having the power (or lack there of) to shape our own narratives. I've sat at the back of the rehearsal room/auditorium/bar taking it all in. Quietly active, storing all my findings in words, thoughts and memories. What was my input? How have I contributed? Hopefully with research, with insights, with opinions, with pints - the impact of the assistant director is hard to pin down. But that's kind of the point. You are there to aid others in their vision, not to imprint your own. That being said I feel like this show is part of me now, and I part of it. Soon it will finish its run and I will miss it, yet feel richer for having it committed to the memory bank. - So what of who you are is actually up to you? This - amongst a lot of other things - is one of the things A Number has me pondering at the end of week three of rehearsals. The notion of having free will, of you being somehow a collection of choices, is one we take for granted. As directors we are faced with a lot of choices. But what a play is forces or it would be a different play wouldn't it? A Number is not a forceful play, that is to say it doesn’t dictate what the staging of it should be, the only stage direction is a single “Silence.” Nevertheless it does reveal itself, bit by bit with each directorial choice. The nature of it shines through and by nurturing it we are unveiling a very human tragedy. Just as at the first read A Number may have seemed like it was about cloning whilst now we see its subject matter expands way beyond that, seeing a run through now we don’t just witness a fascinating story; it is an emotional rollercoaster, bringing us from intrigue to psychological thriller, to utter heartbreak. It is very human and humans are complicated. Caryl Churchill doesn't shy away from that, she brings a smorgasbord of emotions whilst tickling the intellect. One of the choices we have with plays is what cast we assemble to breathe it, live it whilst it unravels in front of the audience; and the crew we get to stage it. I can't think of a better choice for Bernard than Brian and I can't think of a better Salter than Peter, in fact we are at the point of not seeing them as coworkers but as son and father of sorts. Zinnie is also the perfect choice as director for this, confident enough to explore and experiment with the material whilst firmly rooted in her vision and reading of the play. Not every director trusts her cast or indeed the material like that, creating the collaborative spirit in rehearsals that A Number requires. It's a joy to witness. This trust extends to designer Fred, whose brilliant set has been unfolding its magical layers for us this past week; MJ (pictured), whose music is perfectly stirring and Ben whose lighting I cannot wait to see. Each artist has taken to heart what Zinnie set up with, which was to nurture this play by ‘not getting in its way’ - meaning letting the story be the star of the show. Whilst every artist will have their creation firmly on display, an unmistakable signature, it is not about showing anything off apart from the delicately woven plot, characters and world of the play. This has not been a process of meetings of egos but of a cast and crew collaborating to give their collective best to do a brilliant play justice - and I’m feeling very lucky to be part of that. We are off to tech, ready to explore the nature of the piece once more in a new nurturing environment. More is yet to be revealed, I’m sure, but mainly we’re ready to discover how the choices we make will affect you, the audience. Come and see. There's been a lot of fiction about cloning, e.g. Orphan Black, The Island, Jurassic Park, but very few are set in a 'normality' like A Number. We are not in the future, we are not in an alternative universe or dystopia. In fact you wouldn't need to be for the events, the cloning of human beings, to have occured. The future is now. Pretty much. Or it could be. Researching for the show I found out I've done a bit of cloning with my grandmother (breaking off pieces of plants to grow a new one). You probably have too. It's not future technology, scientists first did an artificial embryo twinning in 1885. You can, if you have the cash, get your diseased pet cloned if you like, which a few grieving owners are taking advantage of right now. Right here, in Edinburgh, Dolly made her mark in 1997 and the newest research, twenty years on, is still developing the science of cloning with her seemingly untimely death as a starting point. How do we rewind the clock on cells we clone to an embryonic state? They're figuring it out. In A Number the father, Salter (Peter Forbes), has found a way to go back to the start, begin again. We've been grappling with this, as well as many other aspects of the story, mapping out the events, the truth and the lies and the spaces in between, in rehearsals. Caryl Churchill's play is written not just about cloning, not just about identity, not just about the argument of nature versus nurture but about family itself, parenting; and as we go through it, line by line, the incredible layers of the story unfold. At first read the play is about cloning. At read, say 50, it's about life itself. The text is written in a way that is very open, often ambiguous with unfinished sentences, broken thoughts and communication breakdowns on every page. I've personally tried to find a compass of sorts in the commas, the full stops and the question marks. The actors, Peter Forbes and Brian Ferguson, have their own way of making sense of it, a sixth sense I think, and of course Zinnie Harris brings the expert insight of a playwright. Together we are decoding it, making decisions on 'what it is', but at first glance the possibilities are numerous, and a sentence said a certain way can change the meaning of a scene. The text being so open gives us real freedom to explore before deciding 'what it is' which is incredibly rewarding. When answers reveal themselves we feel like we've found gold. Because in Churchill we trust, 100%, and it really feels like she trusts us too, to find our path through the web of possibilities she's spun. Like a group of scientists we are looking really closely at all the data before presenting a result, making calculated and detailed decisions each step of the way. I think our findings become more and more incredible every day, and I for one can't wait 'til we can share our great discoveries. 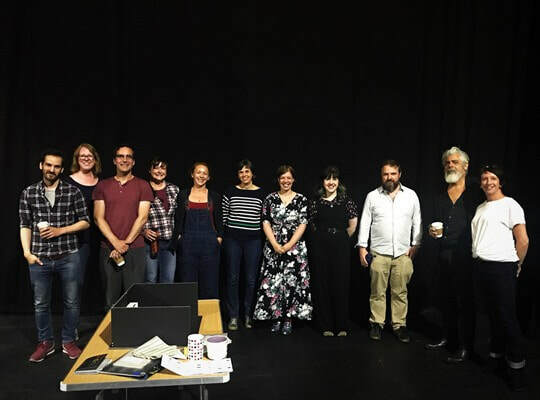 Insights from being an FST bursary assistant director to Zinnie Harris on A Number by Caryl Churchill at the Royal Lyceum Theatre, part of the Edinburgh International Science Festival and being a JMK assistant director to Gareth Nicholls on Ulster American by David Ireland at the Traverse Theatre.